The initial position of the boot on ski can be considered as a match of the middle mark on the boot with the “boot center” mark on the ski. It seems like then the behavior of the ski should match the engineering thought of the creators. Unfortunately, this approach leads to some questions, the general answer to which can be formulated: “Yes it does not matter all this, the main thing is not to shift the boot back”. I remember the time when there were no marks on the boot and skis. In the instructions for installing the bindings, it was indicated that you need to combine the toe of the boot and the center of gravity of the ski. Or move binding position forward by a centimeter, if you pretend to sports. With this approach, the position of the middle of the boot on the ski depends on the size of the shoe. In this there is something. I noticed that experienced skiers with boot size smaller than “standard” usually tended to mount bindings forward. For the last 10 years I has been confusing that position of the boot, depending on the manufacturer, can differ up to three centimeters on slalom skis with the same length of 165 cm. This difference immediately strikes the eye, for example, when you are lifting with a colleague on a lifts of the “anchor” type. Probably the best way is to trust the manufacturer. But this season and it did not worked. At the end of last season, I moved to the Ogasaka ski of 2015 model year. 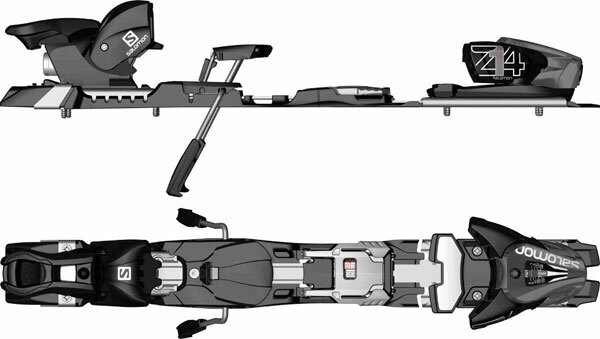 These are skis that are left from the tests, so they have Salomon bindings, which allow to move binding position forward or backward with steps 2.5 mm! I matched the marks and rode until finish of season. And after the season, in the process of comparison with the next model year (2016), I found out that the manufacturer moved mark of boot center forward by 7 mm. But the shape of the side cut remains the same! Which manufacturer I need to trust, from 2015 or the same, but from 2016? Still it is possible to address to the senior comrades, to look at their position of bindings and to try it. So in general, the rule “move the bindings forward, the ski became more maneuverable, move backward – it better writes the arc” of course works, but it is not clear “zero point” from what to move binding position. It’s all in theory. In practice, bindings with the possibility of shifting appeared for me on Atomic ski 15 years ago. Of course immediately tried to move and came to the conclusion that the influence is not significant. After a couple of descents, something is compensated for in sensations and the ski again becomes as it was before the shift. Therefore, I installed approximately in the middle, in accordance with the traditions of my colleagues. Traditions, incidentally, are issued for slalom in Moscow to shift to a “click” (7.5 mm) forward. By the way, gradually Atomic hid the mark on skis, or rather replaced it with an inconspicuous dot with a felt-tip pen, that is, recommendations from the manufacturer about the position of the bindings can be considered, there is none at all. This season I need to shift bindings quite often. For a couple of months I carried Ogasaka SL skis of model year 2017 and gave it to those wishing for thoughtful testing (for more information, see: Ski Ogasaka Triun SL 16/17. Part 4, test on snow). The bindings, in addition to being adjusted to the size of the boot, were allowed to move forward or backward in 2.5 mm increments. Skis Ogasaka SL 2017 is quite tough and very “rail-like”. Probably need to be reminded what I understand by “rail-like”. This is when the shape of the sidecut corresponds to the free deflection of the ski. Read more here: Compliance ski sidecut shape to deflection. Rail ski likes to cut an arc, quickly restores it after all unevennesses. There is also a disadvantage, such a ski do not want to leave arc. The turn, especially in the slalom course, consists not only of the cut arcs. Maybe that’s why for club sports “rail” is not supported by all manufacturers. Perhaps because of the “rail” in these skis it is sharp dependence on the position of the bindings. The shift of 5 mm changed the behavior of the ski dramatically, by 2.5 mm is very noticeable. Opinion is not just mine. Approximately 40 people took part in the tests, many of whom ski much better than me. I noted several interesting conclusions. Firstly, the position of the bindings for free descent and for the slalom course was different. The difference is about 1 cm forward for the course. Secondly, the position of the bindings strongly depends on the habit. For example, on Blizzard, the bindings are much forward, so on Ogasaka those who ski on Blizzard put it to about the same position, so that the sense of ski were about the same. Eugene Strizhov, for example, after two days of testing, stopped at the forward position from the recommended to 1.5 cm. This experience I used and on my skis. A significant part of the season rode on my Ogasaka – 2015 at + 7 mm and another + 10 mm from the mark. And on the test skis (2017) – just + 10 mm. In addition, it became clear that the position of the bindings can not be considered as selected once and for all. As I’ve mentioned above, the sense of the arc greatly changes depend on position of bindings. For example, when the shift is strong forward, the ski “loves” when you “hang” on its toes. When you do this she decisively turns. In a free descent sharply and across the slope, but in the course gently leads you to the next pole with very good angles of edges. On Ogasaka GS-M (Skis for giant slalom from small hills) I put the Atomic bindings. In free skiing put “on the click” (7.5 mm) forward, otherwise at first fell on the inside ski. On the course, after getting used to the skis, I pushed back the mark. And then on the advice of Alexei Yolkin, even a click back. Alexei on his skis and rides so, considers that so more quickly. And I (yet) returned to position on the mark, in order to be more confident in the trajectory. 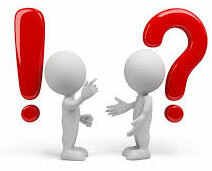 Move binding position must be in the construction! I do not understand why from the range of sports bindings the possibility of a shift is laid only in the Atomic (Salomon), and even with a rather rough step of 7.5 mm? After all, between the bindings and skis there is a platform, which takes on the negative consequences of such additional “iron”. Therefore, an additional layer of “sled” on the mounts will not spoil anything. Ogasaka factory put on test skis the bindings with the possibility of an independent shift of the head and heel. This is Salomon or Tyrolia. Until 2016 they put Salomon Z14 SPEED, now Salomon produce only Z12 SPEED (scale to 12-DIN, this may not be enough for a normal course). Shift step is 2.5 mm. In this Salomon for my taste is too much plastic in the mechanism of adjustable connection of the toe and heel. Tyrolia (PRD series) looks a more hard (there is metal in this place), but they are only up to 12 DIN. However, in the “Head” variant I met up to DIN 15. Shift with step 5 mm. 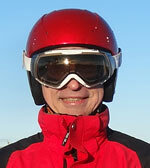 I will summarize the results, which came thanks to the organization of testing the “rail” slalom skis in this season. Bindings for amateur (and above) sports must necessarily have the ability to shift forward and backward. Best with a small step, 2.5 mm. Step 7.5 mm, as in today’s only sports bindings Atomic, quite rough. In general, it seems that the manufacturers of bindings seem stop the progress. Overlooking the last 20 years show that the design, and even the models of bindings do not change (except color, sometimes shape). That is, the bindings are now the same as they were for classic skis, before the carves. Position of the bindings affect stronly how the ski will turn. In the turn, to a greater or lesser extent, there is a cut part when the skis ride along an arc. The shape of this arc is determined by the sidecut and deflection. 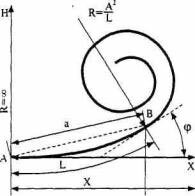 I think that it is close to a clothoid, an arc with a variable radius “the more forward, the steeper”. Therefore, the point of application of force indluence tohow the ski turn. Of course, one can assume that it all depends on the stance, on how much the knees forward, whether the “shoulders” have covered the heads of the bindings, but in any case the transfer of effort to the skis is done only through the bindings. The “rail” of skis shows this brightly. 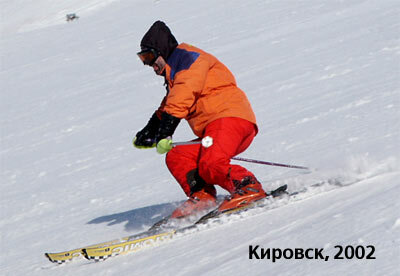 If the ski is not raily, it still has a cut portion in the arc and the same dependence on the mounting of the bindings. It’s just not so noticeable. The position of the bindings is not constant. Move binding position is one of the adjustments. Maybe not everyday, but it is required quite often. Position depends on current habits, the feeling of the arc, the technique of skiing, the steepness of the slope, the setting of the slalom course, the condition of the cover and, perhaps most importantly, from the speed. I think that after leaving Moscow to the mountains, you must immediately move the bindins back, at least to 5 mm.